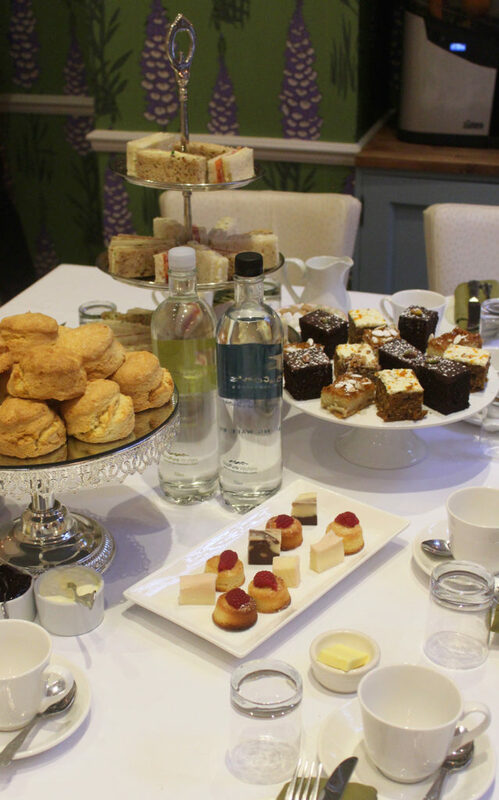 Last weekend, I was invited to Harington’s Hotel in Bath for the day, where I got to meet lots of other lovely bloggers, and I was shown around their gorgeous hotel in the heart of the city. Bath is one of my favourite places in the UK, so when I saw that I had the opportunity to visit there for this event, I was really excited and couldn’t wait for the day to arrive! 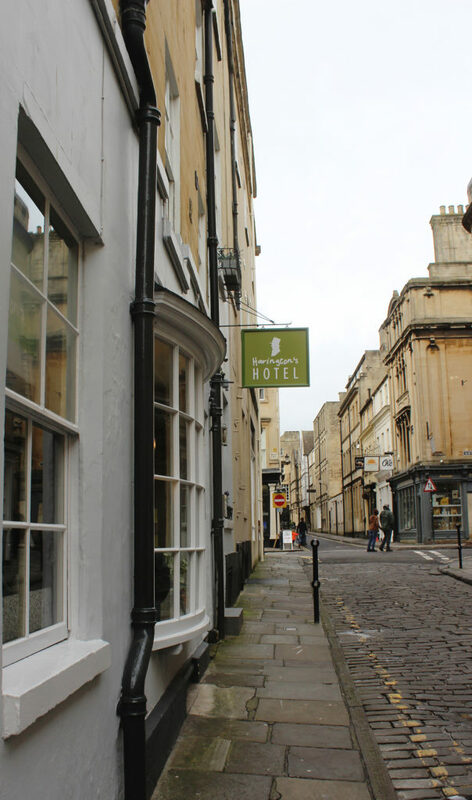 The charming 13 room boutique hotel is located on Queen’s Street, a peaceful street only a few steps away from all of the wonderful shops, roman baths and stunning abbey. It’s in the perfect location for when you want to get away to Bath for a long weekend! Upon arrival to the hotel, we were each given a variety of cocktails, chocolates and canapés to try. You could really see all of the effort that had gone into the preparation of the event, and all of the food and drinks looked beautiful. Although I don’t drink alcohol, I still love looking at cocktails as they’re always so pretty! 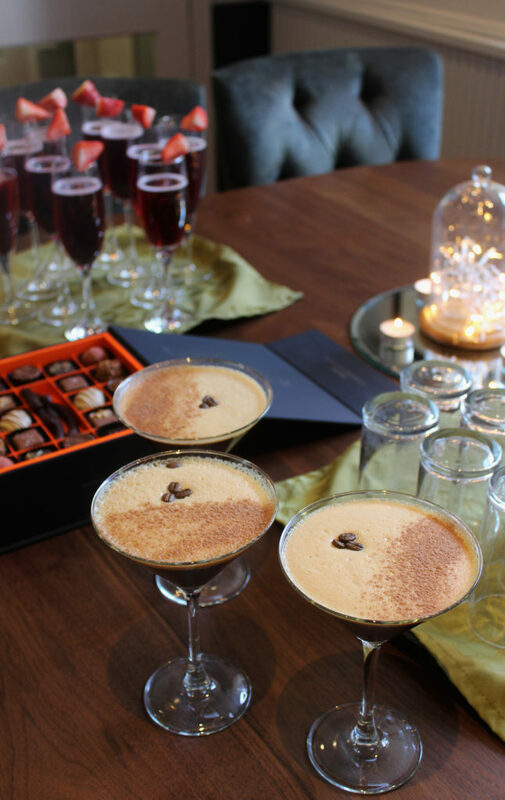 I particularly liked the look of their coffee martinis – they sounded so delicious too. I’m going to have to make a non-alcoholic version at some point! Then, after we enjoyed our drinks and nibbles, were shown around some of the rooms and apartments of the hotel. I really liked their colourful wallpapers – especially the deep pink one! When we’d looked around the hotel, we were each treated to lovely arm massages and sound tuning fork treatments from Lush Cosmetics – they were so relaxing. We did these in groups of three, and I went with Kate from Veggie Desserts, and May from Red Velvet London – two lovely people that I was so happy to have met! They both have such beautiful blogs too. Lastly the day finished with a decadent afternoon tea for us all. At this point, I had to rush off to catch my train – but I still had just enough time to photograph the beautiful spread of food. The hotel also kindly gave me a vegan option and goodie bag to take home with me! Thank you! What a cute little hotel – I love the funky decor. I have been meaning to go to bath for ages (I am making it my mission to explore more of the UK), so I will keep this hotel in mind. O wow, how lovely!! The rooms look so beautiful! Such a lovely place to meet up with bloggers, I love Bath and visited a few times when my daughter was studying there. Oh, I absolutely love the cobblestone roads and the history of those buildings. No wonder Alex fell in love with the UK when she studied there. The hotel is lovely and the food looks amazing. Thanks for sharing, Harriet. I love Lush! I’ve never heard of the sound tuning fork treatments though–how do those work? :O The hotel is super cute, and all that food looks delicious! Wow! What a lavish hotel, Harriet! Such a lovely place to meet up with bloggers. Super nice and cosy place! Too bad I don’t live anywhere near that hotel, because it is gorgeous! Looks like they sure know how to host a group of bloggers! So glad you had a good time AND they gave you goodies to go! Winning! 😉 Cheers, my dear! You’ll have to come over to the UK and visit!!! Thank you Cheyanne! The hotel looks lovely! Glad you had great time! Thanks for sharing! It was a lovely day in Bath and so nice to meet you!